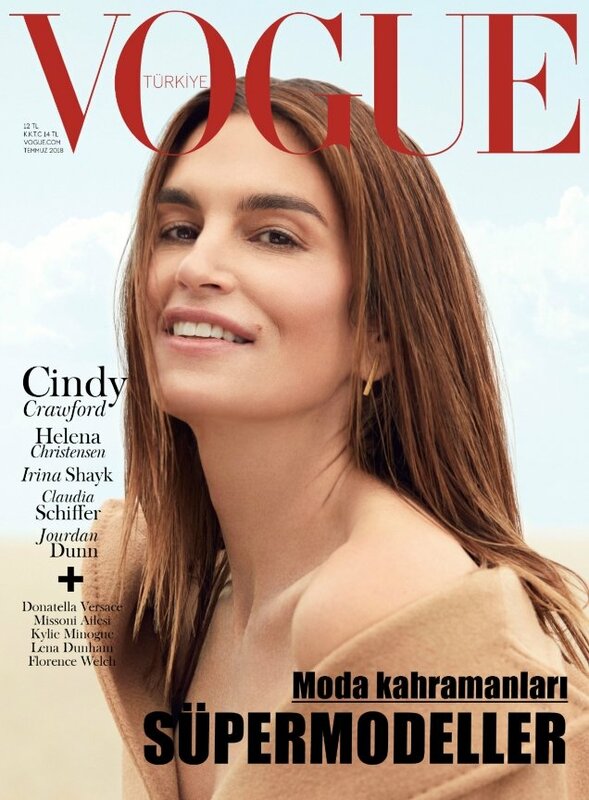 While Kaia Gerber recently added an advertising campaign for Moschino and a pair of Vogue Italia covers to her ever-growing portfolio, mom Cindy Crawford reminds the industry she’s still in the game by scoring the cover of Vogue Turkey. The magazine went all out last month, giving us (a heavily Photoshopped) Mert Alas and Kendall Jenner as cover stars for its 100th issue, but this month the mag went old school with the OG 90s supermodel. Photographed by Miguel Reveriego and styled by Simon Robins, the all-American beauty sports straight hair and one of Max Mara’s signature camel coats on the cover. But just like with Town & Country back in May, Turkish Vogue seems to have missed the mark with its latest cover shoot. Our forum members could barely believe their eyes. “Oh lord… I love Reveriego but why are all his Vogue covers so bad?” asked Ed.. the moment the cover dropped. “I don’t think I’ve ever seen a less flattering photograph of Cindy,” a shell-shocked dodencebt stated. “This is the worst cover image of Cindy I have ever seen and I love her. Even paparazzi pics are much better,” called out fierrousa. “It’s truly awful. This is probably the worst professional photograph I’ve EVER seen of Cindy Crawford, and they put it on the cover of Vogue?! Absurd,” expressed happycanadian. “This is genuinely terrible. I hate to say it but she looks actually unattractive here, bet she’s fuming!” 333101 declared. Are you dumbfounded over the outcome as much as we are? Join the conversation here.